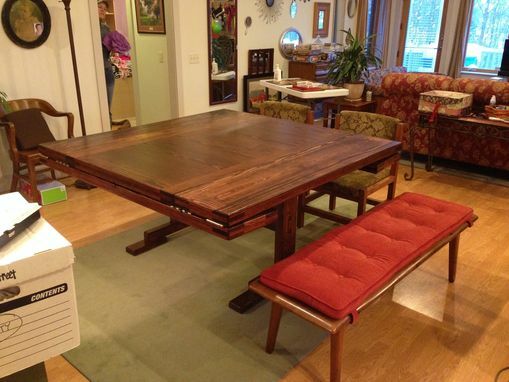 This Trestle Table Re-Make was a request from a customer who had a dining table that she just loved, but her family had outgrown it...it needed to be bigger! After an initial meeting with the customer, it was decided to add two (2) permanent leaves that would make the table top 63" square. Also, two (2) more drop leaves, which fold down & store up under the table top, would be added to accommodate family & friends during large holiday gatherings. The craftsman also recommended that if the top was going to be bigger, then the base needed to be redesigned/constructed to properly support the large, heavy top, and this was done. 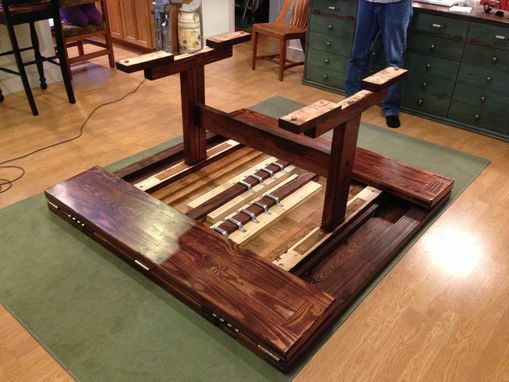 After all parts were constructed & the Trestle Table assembled to check for accuracy & functionality, it was disassembled, stripped of its original finish, and sanded smooth. 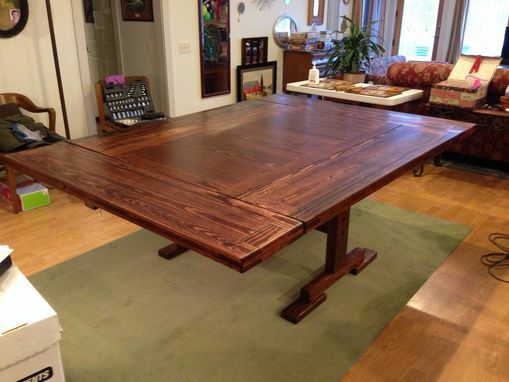 Finally, the Trestle Table was stained with a medium red mahogany stain and given two (2) coats of a satin polyurethane finish. The Trestle Table was delivered in sections and assembled on-site for the customer.